First off, I would like to thank the publisher and author for an eARC of Providence in exchange for an honest review. Receiving this eARC in no way influences my opinions of the novel and all words below are my own. If ‘You’ did not put Kepnes on my must-read list, Providence did the trick. Providence is a tale of love lost and thought buried, only to return with deadly consequences. It is also infused with some Lovecraft horror which will be up plenty of peoples alleys. Jon and Chloe are best friends, but their relationship stretches beyond that label into something neither of them can truly explain. Before Jon is able to finally express his feelings, he is kidnapped by one of his substitute teachers and, for all intents and purposes, changed. Chloe, believing Jon is never coming back, attempts to move on with her life but her thoughts always come back to him. But when Jon comes to and escapes his captors grasp, he finds that he has an overwhelming emotional power over those he loves. Not wanting to harm Chloe, he runs away for good and attempts to find answers to what he has become, and how he can revert back to his old self. Meanwhile, a detective who has an obsession with a handful of recent killings his hot on Jon’s heels and may find more than he bargained for. Providence, much like You, was full of romance (which is not my cup of tea whatsoever) but was so engaging that I couldn’t turn away. Kepnes has a way of drawing you into her world with ease and keeping you there, rooting for her characters all of the way through. I really enjoyed Jon’s storyline and how he attempts to use his newfound power for good, though it comes with the occasional bump in the road. Eggs and Lo were by far the forefront couple in my mind, even though they were secondary characters. They really drove the middle to end parts of the novel and I don’t believe it would’ve been as enjoyable without them. Overall, Kepnes will be a name on my TBR for life, along with a few others I have found since I fell back in love with the written word. 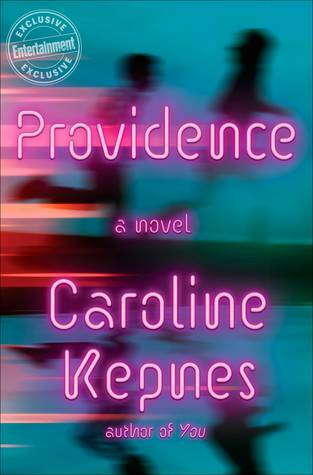 Though I cannot precisely categorize Providence, and I cannot say everyone will love it, I can definitely recommend that you pick it up and give it a shot. Totally weird and wonderful book, right? I have to say, I was really annoyed with Jon for most of this novel. I loved Eggs though, his part of the story really made it for me. Definitely a weird one but I couldn’t put it down. Absolutely agree about Eggs.